Posted on 4/1/2012, 4:20 pm, by jungrrl, under Project Tutorials. Its guerrilla gardening time! 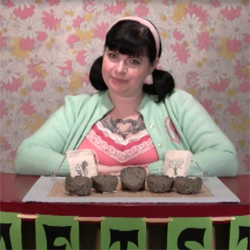 In this episode of Craftster Quickies, kittykill teaches you how to make seed bombs to place in your own garden or to use as and easy way to add flowers in any open, unloved space near you! She also shares how to package them to make great gifts! As you stated in the video – Please be mindful when seed bombing – Even plants sold at local home & garden stores are considered invasive species and could be detrimental to environments. Ignorance is expensive – Thank you, Thank you, Thank you! Very interesting, but how do you “plant” them? Victoria, since you put them in the bomb mixture, that’s all they need! Since they’re already embedded in the clay they can just sprout from there. Just toss them somewhere and the rain will water them. I’d like to specify- use these ONLY in your garden, even if they don’t include so called invasive species. If the species doesn’t naturally live in the area (although it lives a few miles away), there’s a reason for it and its presence might hugely ruin the ecosystem, although you might not see it. I’d have to agree, it might be a bit irresponsible to actually “bomb” places around your community. These would be a really cute gift though! Like a bath bomb for your friends’ gardens! Sounds like a fun thing to do with a kids gardening project. When I read about seed bombs and how they make sowing SO much easier, especially for seniors or long sighted people like me, who have a hard time with seeds and have to be very careful with sowing them, I decided to make my own. But it was not easy due to the same reason of poor eyesight and the extra precaution when handling seeds to prevent them from scattering. I looked for them online and was a bit disappointed that most seed bombs are available as a wild flower variety. This detered me especially due to the comments about invasive species. They specialize in custom making seed bombs from specific varieties only. I ordered their Rudbeckia seed bombs and they started sprouting in a couple of days!! I look forward to some carefree sowing and gardening and plan to order more!! Hope this helps others get their early starts early! LOL, a little paranoia about what to plant and where in these comments. If it is not an invasive species, it’s safe to seed bomb anywhere. Just like wind, birds, and other creatures, we are free to spread seeds in our environment without danger. Just make sure they aren’t genetically modified, that’s important. The rest of it? Relax. Nature is no dummy. If the plant can thrive where it lands, it belongs there. Sorry craftylittlemonkey but that is a -HIGHLY- irresponsible statement. It’s called invasive because it displaces that species already there which the local critters depend on. Florida is overrun by plants and animals dumped in the very same die or thrive carelessness. They do great there cause the land they came from is similar but there are no creature that eat or use them there and the land is over run quickly because a human helped them cross a natural barrier like desert and snow zones. Its a wonderful idea and I wanted to replant some areas along the highway where city workers just dumped dirt where it was convenient and killed beautiful wildflower patches. If you do it though check your local library for what should be there and nurseries can provide REGIONAL NATIVE seeds bags with a wonderful mix.